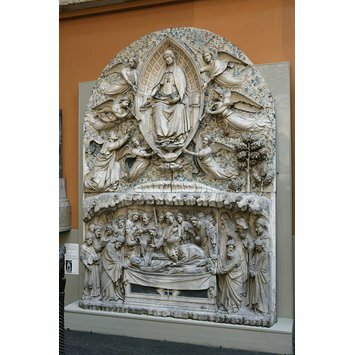 Plaster cast taken from a portion of a tabernacle after marble original with inlay of coloured marble by Andrea di Cione, known as Orcagna, situated in the church of Or San Michel, Florence. 'Andrea di Cione, Florentine painter, director of works of this oratory executed (this), 1359)'. 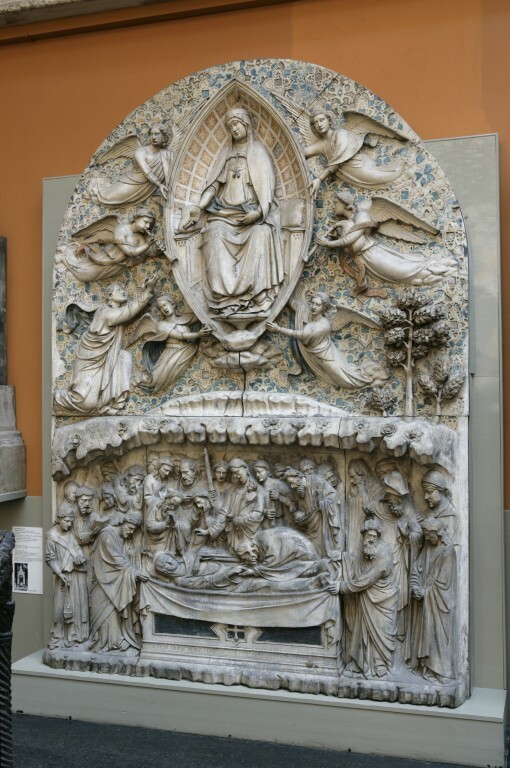 Above: The Assumption of the Virgin, the Virgin seated in a mandorla, supported by flying angels, drops her girdle to St Thomas. Below: The Death of the Virgin. At the bottom, the inscription: ANDREAS CIONIS PICTOR FLORENTIN'/ORATORII ARCHIMAGISTER EXTITIT HUI MCCCLIX (Andrea di Cione, Florentine painter, director of works of this oratory executed (this), 1359). The present cast comprises only the relief of the rear portion of Orcagna's tabernacle, which contains, in front, a painting of the Virgin and Child with eight angels, by Bernardo Daddi (documented 1312; d. 1348), painted 1346-47.